Nobody’s sure of the risk of a drone hitting a plane, indeed, no one actually knows how many drones are out there. But in a move that shows it’s better to be safe than sorry, the organization that looks after 850 US airports is now working with a startup to help drone owners and air traffic controllers communicate should a risk arise. 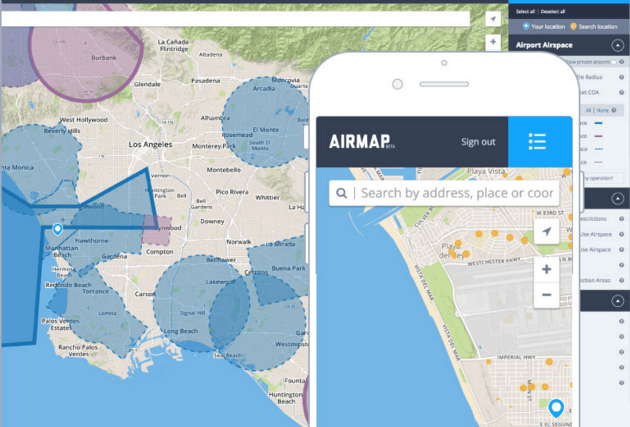 Airmap already maps drone flights by signing up individuals and manufacturers to share their GPS data on the platform, while helping them navigate safely by offering access to its Web app that shows things like restricted airspace. Airmap’s now using its drone mapping software to build a ‘Digital Notice and Awareness System’ dashboard specially for use by air traffic controllers, who will be able to get real-time location data about nearby drones and contact the pilot directly if they need to. Big drone brands including DJI, Yuneec and 3DRobotics are all participating in the exercise by hooking up their apps directly into Airmap’s system. So far, 80 of the American Association of Airport Executives’ airports have also joined the… pilot pilot. This announcement comes soon after the Federal Aviation Authority, working with drone makers, made its second rapid set of recommendations for the future of the industry, following December’s efforts around getting owners registered to fly. The group considers that drones weighing less than 250 grams, most likely to be used by people rather than companies, pose a very small chance of hurting someone should they crash, so they are unlikely to be subject to flight restrictions in urban areas. Heavier drones will have to withstand significant testing and get certification before they are allowed to fly here.